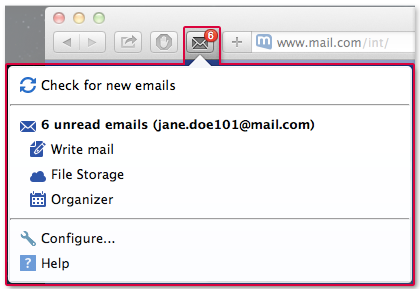 The envelope icon on the left next to the address bar of your browser notifies you of new e-mails. mail.com MailCheck automatically checks for new e-mails at regular intervals. Click the envelope icon to access your mailbox and other functions. If there is more than one Account connected to MailCheck, click the envelope icon to view a list of Accounts including the number of unread e-mails in each one.